Attention all Clarin's fan / facial lovers! 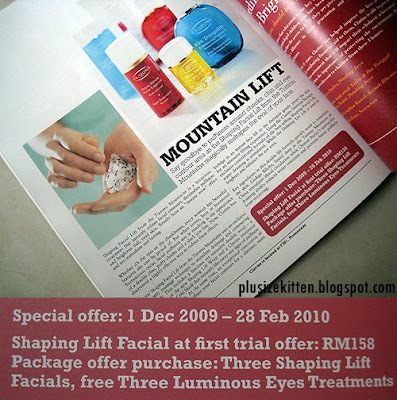 from 1st Dec until 28th February, 2010, Clarins Institute is having a Shaping Lift Facial at first trial offer RM158 for newbies! I am so going for this because I love Clarin's Facial. I probably buy and then use it later! coz I'm under a skincare regime programme now for 3 months! *joy* I will talk about it later hehe but first Clarin's Shaping Lift Facial is retailed at RM258 or so (if I could remember). It's more towards achieving a more radiant, lifted, "shapely" or should I say "slimmer" looking face hehehe??? oh well don't listen to me you better call up your nearest Clarins Institute to find out alright!